Please click on the logo to go to the donation page. You can aid in the fundraising efforts by purchasing a bottle of wine (or donating a cash amount to be used to purchase a bottle of wine) from the selection. To stock the wine cellar, the Houston Arboretum is seeking donations from our Host Committee, Board of Directors, and guests of the Alfresco Gala. You can aid in the fundraising efforts by purchasing a bottle of wine (or donating a cash amount to be used to purchase a bottle of wine) from the selection. 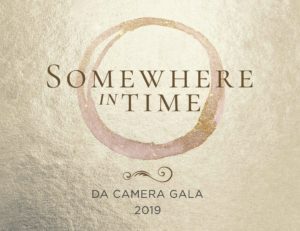 The 2019 Da Camera Gala, Somewhere in Time, will take place on Saturday, May 4, 2019 at The Houstonian Hotel, Club & Spa. You can help Da Camera in their fundraising efforts by purchasing a bottle of wine (or donating a cash amount to be used to purchase a bottle of wine) from the selection.